Garment workers continue their agitations... and the uncertain role of unions. Wednesday 13 Aug - Dhaka; over 5,000 workers at Reedisha Knitex factory staged a demonstration inside during their lunch break at 1pm; they demanded a pay rise to compensate for the rampant inflation of food and other essentials such as rent and transportation. Their demands being ignored by management, they set about ransacking the factory. This sparked a clash with factory officials, 15 of whom were injured. 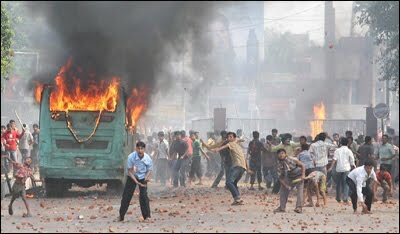 By 2.30pm the workers had left the factory; they then blocked the main Dhaka-Mymensingh Highway for three hours. 300 Rapid Action Batallion (RAB) and police personnel arrived and requested the workers remove the blockade - the request was ignored. Security forces then asked the factory management to agree a wage increase but this request too was ignored. At around 6pm the RAB and cops fired gunshots and teargas into the crowd and baton charged, injuring 50. The Superintendent of Police, expressing typical police 'logic', declared; "We requested both the factory authorities and the workers but none of them gave any response. If the factory authorities responded, such an untoward incident would not have occurred" - i.e., 'if the bosses hadn't refused to grant a pay rise, we wouldn't have shot the workers'. RMG employers' federation the BGMEA has threatened to strike within the next week if the government does not begin to take effective measures against the continual costly worker vandalism in the industry. While still stalling on awarding any pay increases to workers, the BGMEA has expressed annoyance that its sister organisation, the BKMEA (representing knitwear manufacturers) has already agreed a 20% increase. Referring to the recent worker’s unrest in various garment factories in Savar and Gazipur, Amirul said it was nothing but the result of their desperation brought about by hunger and suffering. He called on the workers to refrain from taking part in any destructive activities including damaging the factories." "Nazma Akter, president of Sammilito Garment Sramik Federation, a platform of garment factory workers, said the workers agitation broke out for a pay hike in the wake of higher prices of essential commodities. She said although the majority of owners pay salaries under the current wage structure, the minimum wage of Tk 1,662.50 a month is too little to maintain livelihoods. "So, it needs to be increased through negotiations, but not by damaging factories," she added. She said the government should also come forward to settle the issue of low salaries of the workers. "The workers, owners and government officials may sit together again for a solution," she said." Nazma Akter and co clearly don't have as much influence over garment workers as they would like; they are far too violent and unruly for their liking. Trade Unions still have not established any dominant presence in the industry. Neither the state nor bosses are fully convinced of their permanant usefulness in controlling class struggle and have always denied any official union recognition in the vast majority of RMG workplaces - but Akter and co are working hard to convince them of their common interests and to show how useful they can be for the ruling class. The absence of such professional mediators to take away direct control of struggle from workers is one definite strength of the RMG workers. Akter is a former textile worker who started factory work at 11 years old. But such 'credibility' should not blind us to the role of those who seek to lead struggles in a particular direction. The evidence shows that Akter and co are willing to act as typically opportunist union bureacrats (happily, so far, Generals with few troops); in 2007 Akter joined an alliance of Bangladeshi union hacks and RMG employers at a United States Trade Representatives (USTR) hearing in Washington. The hearing debated a motion by the AFL-CIO to withdraw the US Generalised System of Preference (GSP) from Bangladesh (GSP is a preferential trade tariff for imports from 'developing countries'). The AFL-CIO accurately claimed what everyone knows - that Bangladesh does not allow labour rights in export processing zones (EPZs). "In its petition, the AFL-CIO made four complaints that included violation of domestic and internationally recognised workers' rights in EPZs, violation of domestic labour laws and internationally recognised labour standard in readymade garments (RMG) industry, similar violations in shrimp and fish processing industries, and violent actions by government security forces against trade unionists, workers and labour rights groups." If the US authorities want to empower global women, especially the Bangladeshi poor women, they should not consider the complaint lodged by the AFL-CIO, rather they should continue the GSP facilities for Bangladesh," Nazma Akther, president of the Sammilito Garments Sramik Federation, told the journalists. She said the AFL-CIO prepared the report on Bangladesh on the basis of a study conducted by its local representative Solidarity Centre Bangladesh, which has no knowledge about the labour rights situation here. About 177 elected workers' welfare committees are actively working in the EPZs of Bangladesh, she said, adding that the association is also not aware of any incidents of repression on workers in the industry. There are two agendas here - both in the pursuit of extending trade union representation and its role in the labour process, both seeking a 'fairer' more rational and stable form of exploitation of labour. The AFL-CIO pressures its government and the international business community to penalise those countries that won't let unions in - which is also a form of protectionism against those same countries who undermine US industries with cheaper imports based on cheaper labour. Conversely, the Bangladeshi union hacks seek accomodation in the labour process by showing employers that they understand and share the bosses' priorities of ensuring strong national productivity and competitiveness. They hope to convince employers that they can play a useful role in mediating conflict to deliver a more disciplined and efficient workforce; and so dissipate the immediate mass responses now typical of garment workers by channelling them into long drawn out bureaucratic procedures. Labour leaders Salahuddin Shawpan, Selina Ahmed Tania, Jahanara Begaum, M Delwar Hossain, Sahidullah Badal, Sultana Khan, Rokya Sultana Anju and Md. Nurul Islam were present at the press conference among others. leaders of RMG labour organisations yesterday urged the US government not to discontinue the GSP facility for Bangladesh just to satisfy the US-based labour rights group. They said if the US government considers the false and baseless petition filed by the rights group, Bangladesh's RMG sector will face a massive setback, resulting in joblessness for female garment workers. The union leaders and bosses achieved the retention of GSP. Akter and the other 'labour leaders' (many - or most? - of whom are in fact middle class reformers and liberal professionals with no experience of factory work) or anyone who has any "knowledge about the labour rights situation" could hardly fail to be unaware that workers regularly suffer beatings, sexual abuse, starvation wages, police attacks and occasional murder in the RMG factories; her incredible lies in Washington that she is unaware of any worker repression - if ever spoken back home in the presence of the actual Bangladeshi workers she claims to represent - would have got the reception they deserve. At home she is happy to criticise both the conditions of workers - and their use of violence to improve those conditions. But - irrelevant as they appear now; historical experience suggests that if these struggles ever develop towards working class insurrection - Bangladesh being one of very few countries at present with even a slight possibility of such a development - then the unions may, if necessary, be promoted to play a role of last line of defence for the ruling class; by functioning as a form of representation that steers struggles into a mere limited reform of workplace relations and perhaps some modest welfare measures. Things could change - but, judging by past experience and continued ruling class intransigence, it would probably take something close to a revolution to achieve even these basic reforms.